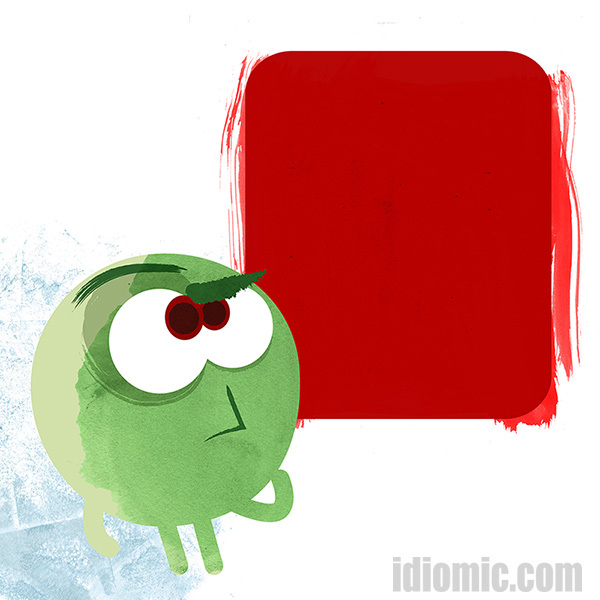 'See red' illustrated at Idiomic.com: definition, example, and origin. Example: The scratches down the side of his prized Corvette made Nigel see red. Ironically, that was the same colour of the paint that was damaged. It is widely thought that to see red comes from the ‘sport’ of bull fighting, specifically the waving of the red cape to enrage the bull. Despite this connection, it actually isn’t the colour of the cape that attracts the bull. Why? Because bulls are colourblind. It’s the movement of the cape that actually gets their attention. There is another phrase ‘like a red rag to a bull’ which seems to back up this theory as it has a very similar meaning. A second theory says it may come from an American phrase ‘to see things red‘ which has fallen out of fashion. This refers to the colour that infuses the cheeks during rage, as your blood pressure soars, sometimes referred to as the ‘red mist’. Iddy doesn’t understand the colour reference at all. When he gets angry, he just goes a deeper shade of green. And it’s not pretty at all. Trust me.